Al Besselink accepts $10,000 in silver dollars from Wilbur Clarke after winning inaugural Tournament of Champions. The original Tournament of Champions was played in Las Vegas in 1953, and the event continues on the PGA Tour to this day, now called the SBS Championship and played in Hawaii. Champions of the event when it was held in Las Vegas include Jack Nicklaus, Arnold Palmer, Gene Littler and many other golf greats. "The Tournament of Champions was the Pre-eminent Las Vegas and Nevada event for many years, bringing the eyes of the world to Las Vegas, right from the beginning when it debuted in 1953," says Jack Sheehan, Las Vegas golf author, historian and 2009 Las Vegas Golf Hall of Fame inductee. "The event drew the biggest names in golf and biggest Hollywood stars to Las Vegas, and was created by Las Vegas' movers and shakers including Moe Dalitz, Irwin Molasky, Howard Capps, Merv Adelson, Wilbur Clarke, and Allard Roen, among others. Roen served as the Director of the TOC for 38 years, including after it moved to La Costa, the San Diego resort which was built by the same group who operated the Tournament of Champions in Las Vegas. 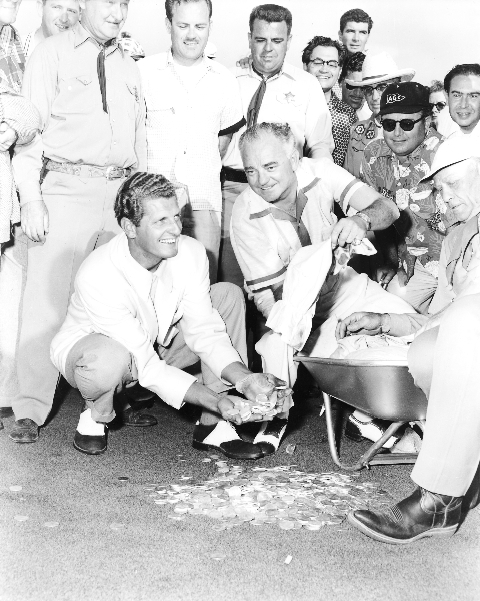 To this day, the event is played on the PGA Tour, but its roots date back to 1953 when Al Besselink collected his $10,000 first prize in a wheelbarrow full of silver dollars."